When we arrived at the room of Pathamma, she was in the same place and position that she had been in the day before. She had not moved in some time and was lying in days worth of her own waste. Near her head sat a bowl of untouched food. The hum of flies surrounding her unmoving form was audible. There were ants in her mouth. 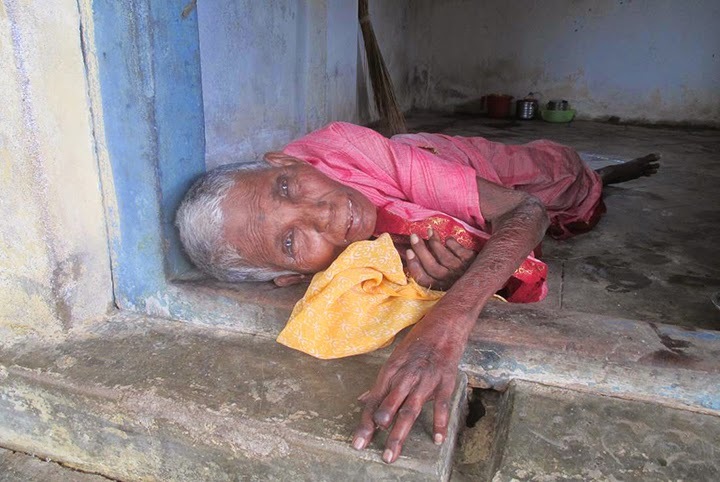 We were seized with pity for this woman who had long since been abandoned by her family because of her illness. No one cared for her. No one loved her. This human being, this soul, this supreme creation of God was left alone to wallow in the degradation that had befallen her and not a single person cared. Filled with the compassion of Christ, we boldly proclaimed: “We will care for you. We will love you. And if you have no one else in the world… you have us.” Girded with the amour of prayer, we stormed the gates of this woman’s personal hell willing to do everything in our power to alleviate her misery, even if just a little bit for just a little while. We had next to nothing in the way of supplies but made do with what was available to us. We asked her neighbors to lend a few things, a pot to heat the water, a wall to hang the saree to dry. None of them were very fond of her so it wasn’t easy but we managed to scrounge up what we needed and then got to work. We washed her saree, cleaned her room, and then came the hard part…bathing Pathamma. We were generally inexperienced which made the situation somewhat stressful and to see a human being in such awful conditions is no easy thing but we did best to put on a smile and to sing while we worked. We suspect that she hadn’t been eating or drinking for a while and as a result, she was a little out of it. I think she didn’t have the energy or the presence of mind to speak to us. She said a few words of refusal when I tried to feed her but that was about it. But while we were bathing her, she reached up and began to wash her own face and at that moment, she gave us smile as bright as the sun. Then, just before we left, she clasped her hands in front of her face in a silent gesture of gratitude. Those two actions, as small as they may seem, meant more to me than a thousand thank you’s. We told Pathamma that we would return and we told ourselves that, next time, we would be better prepared. That was the last time I saw her alive. She died just a few days later alone, and in the same state that we had found her. When we came to pray over her before the burial, we were dismayed to find that even in death, she was uncared for. Her family was notified but no one came so only the bare minimum was done for her and I can tell you that for a lonely leper lady, it isn’t much. There was nothing I could do to change it so I tried my best to accept it. Her funeral consisted of Father Oliver, Latha, Chrisanne, a few men who also had leprosy, and myself. It was very short and very simple. After the funeral, one man approached us and thanked us for the work we had done for her. He said that after we helped her, other people took notice and started to do little things for her also. In saying this, he showed us something that we very rarely, if ever, get to see. He showed us the fruits of our mission. Not only had we brought compassion to this poor woman but it touched those around her also. I feel in some way that by providing me with the opportunity to see this grace, Pathamma gave me a much greater gift than I ever could have given her.